Map from Cole Sutton’s blog. Used by permission. 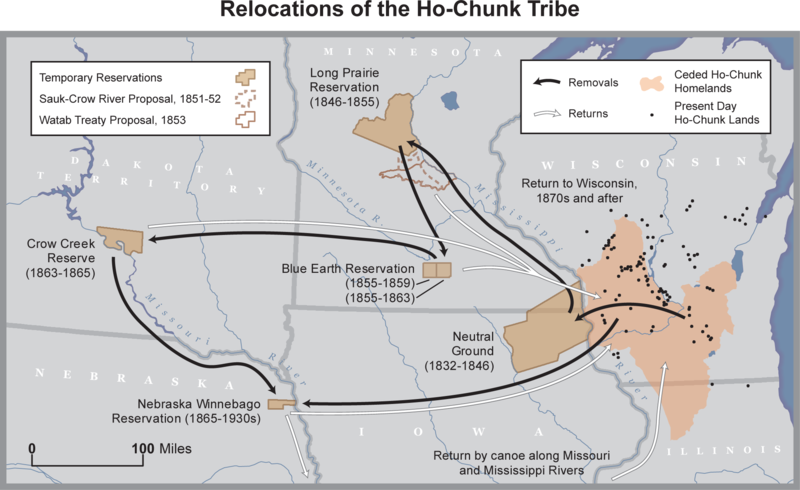 This day in history, Feb. 21, 1863, Congress passed a law — pushed by members of Minnesota’s delegation — to expel the Winnebago people from the state. The Act was fueled by fear, prejudice, and greed; it resulted in land theft and the deaths of more than 550 Winnebago people. The Winnebago (also called Ho Chunk) were expelled from Minnesota in the wake of the Dakota-U.S. War of 1862, a war in which the Winnebago did not participate. Yet Minnesota’s leaders were so eager to free up the Winnebago’s reservation lands for settlers to farm that they expelled the Winnebago before they officially expelled the Dakota. This is a horrifically ugly chapter in Minnesota history. It includes the little known story of the Knight of the Forest, a secret Klan-like group that formed to expel all indigenous peoples from the state. The genocide of Dakota people and the history of the Dakota-U.S. War of 1862 has rightfully been getting more public awareness in our state, but a terribly overlooked part of our history is the atrocious treatment of the Winnebago people. Yes, the Winnebago used to have a reservation in Minnesota. That history is invisible. The Winnebago (also known as Ho Chunk) had been forced to relocate several times, as business and settlers moved west and wanted their land. In 1855, they got resettled on a reservation in Minnesota near Mankato, just years before the 1862 Dakota-U.S. War. While they did not participate in the fighting, the war became the excuse for state leaders to remove them to get access to prime farm land. At the urging of the Minnesota delegation, Congress passed a law exiling the Winnebago from Minnesota before they passed the law exiling the Dakota. Part of this ugly history is the story of the Knights of the Forest, a secret society in Mankato bent on killing the Winnebago. This blog wrote about this last year in a piece titled: Winnebago Removal Act and the Little Known History of the ‘Knights of the Forest’. City Pages has come out with a detailed piece: Knights of the Forest: How Minnesota’s Klan drove out the Ho-Chunk. This story needs to be told and taught. We as a state haven’t acknowledged, let alone repented, from these acts. Two years before the first meeting of the Ku Klux Klan, a secret society of white terrorists had sprung up in Minnesota. This day in history, Feb. 21, 1863, Congress passed a law to expel the Winnebago people from Minnesota. Like many acts of injustice, it was fueled by fear, prejudice and greed. The fear came from the recent Dakota-U.S. War. While the Winnebago (also called Ho-Chunk) had not participated in the fighting, that didn’t stop rumors that they had. The greed came from the fact that the Winnebago were sitting on prime farm land coveted by white settlers. The prejudice and hatred against Indians was part of the country’s fabric. In this case, that prejudice was institutionalized further through a Mankato-based secret group called Knights of the Forest. It was similar to the Ku Klux Klan, but its story much less known.